Within the collections of the Los Angeles Public Library there are city, business and phone directories going back to 1873. 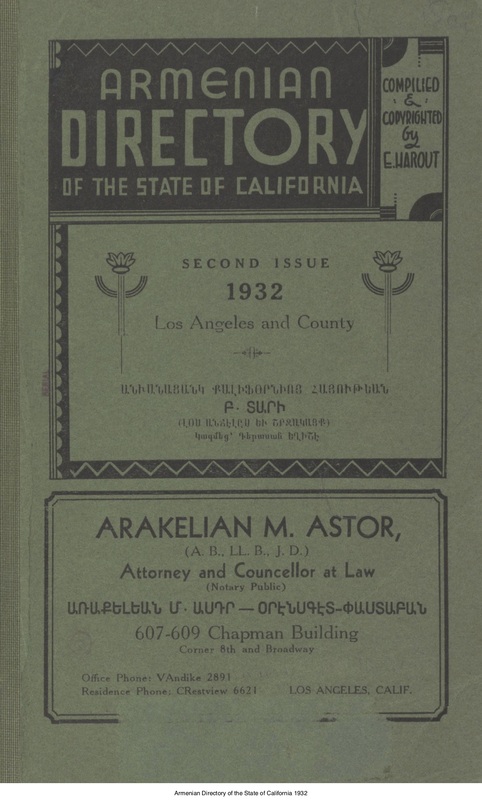 Among the historic books can be found The Armenian Directory of The State of California, 1932, related to the Armenian community of Los Angeles, at that time, numbering a few thousands, many of whom were settled in Pasadena, and throughout the Southland. The first wave of emigration from Armenia came after the First World War when Turks murdered millions of Armenians during the breakup of the Ottoman Empire. Most of the refugees came from Western Armenia near Turkey. Here in Los Angeles they established an industrious, skilled, hard-working community. They built churches, founded benevolent societies, and created cultural and social institutions centered on music, food, and dance. Their professions in their new adopted city were many and varied and included dentists, physicians, attorneys, tailors, grocers, bakers and funeral homes. The Standard Crate Co., Inc. built fruit boxes and gave “special attention to Japanese customers” many of whom grew citrus. Ten years later these same clients were rounded up and put into detention camps, a tragic and historical irony the Armenian advertisement could not foresee or imagine. 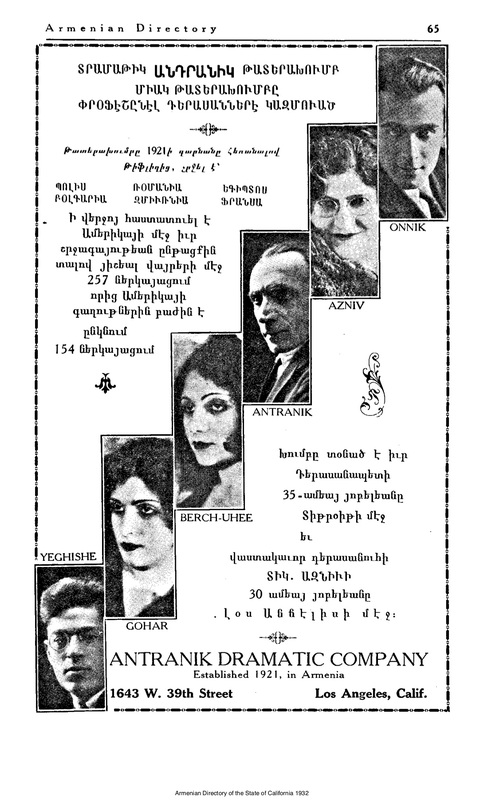 The Hollywood movie industry was already famous worldwide when the Antranik Dramatic Company advertised their actors. Mastery of frivolity has always been important in this city. It seems that many Armenians did well here. 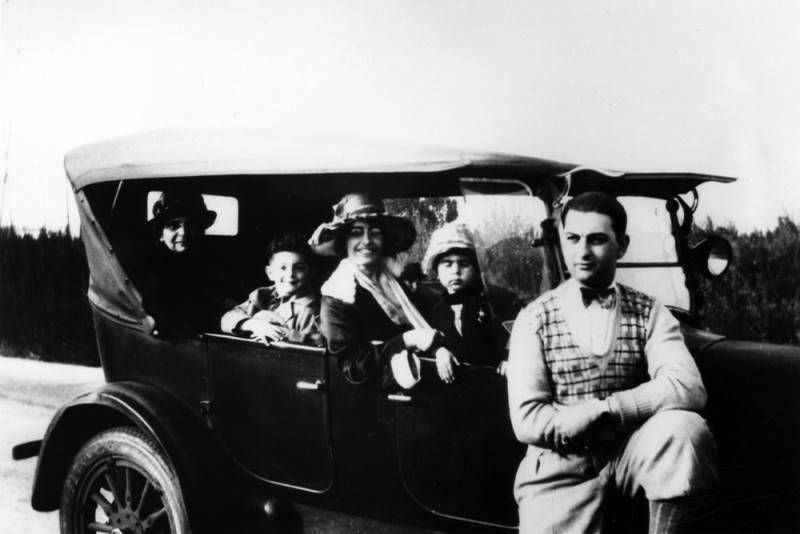 The Altoonian Family, and their sedan, is seen below in a 1926 photograph. 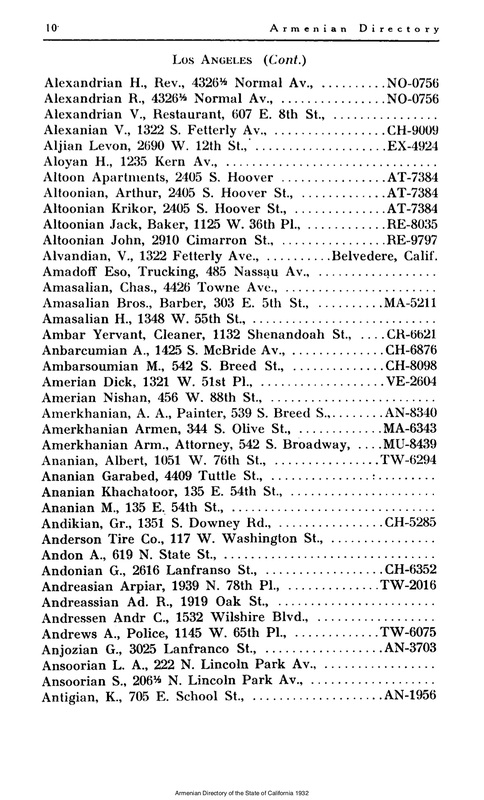 The 1933 directory lists an “Altoon Apartments” at 2405 S. Hoover, and several Altoonians who lived at that address. 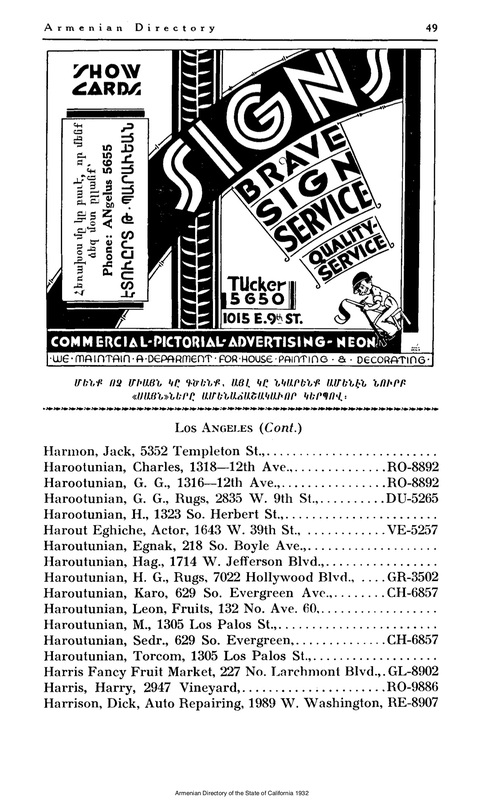 A magnificent Art Deco ad for signs is a last breath of the 1920s with its rhythmic patterns and syncopated layout. 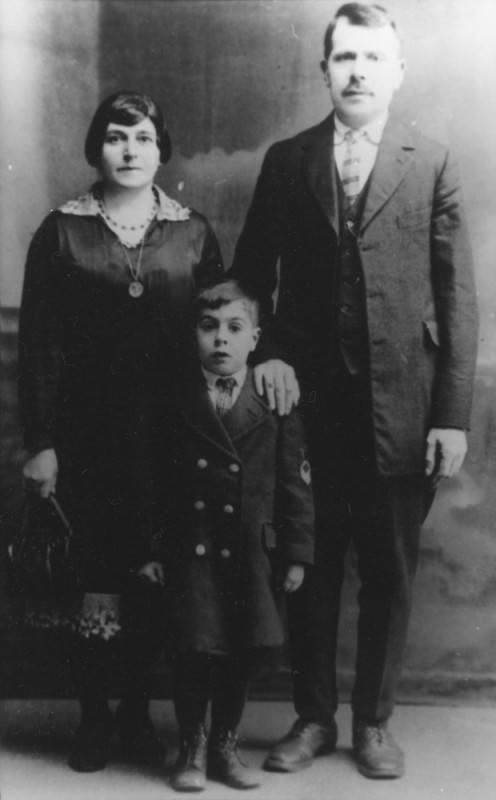 The Luther Eskijian family is shown in 1924, perhaps in front of their home at 1738 Bridgen Rd., Pasadena. Boys are in knickers, those short pants that children wore up into the mid 1930s. 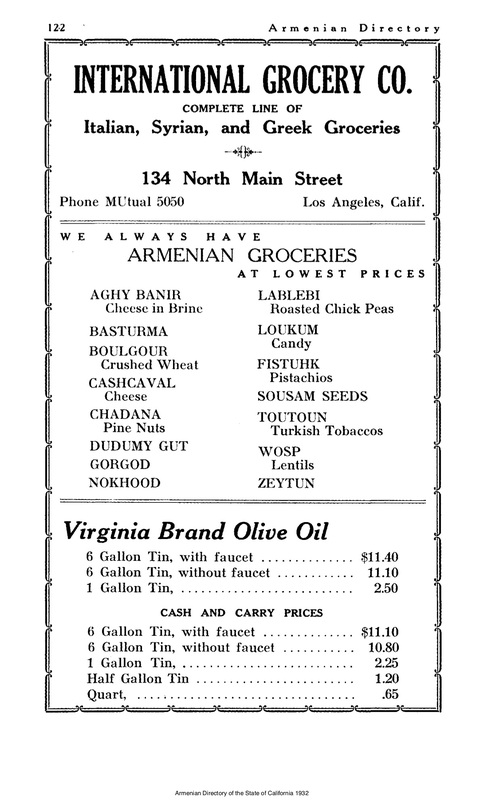 The International Grocery Co at 134 N. Main St. had such Armenian foods as aghy banir, lablebi, boulgour, chadana and fistuhk. Or cheese in brine, roasted chickpeas, crushed wheat, pine nuts and pistachios. A one-gallon tin of olive oil was an enormous luxury item priced at $2.50 ($25.68 today). 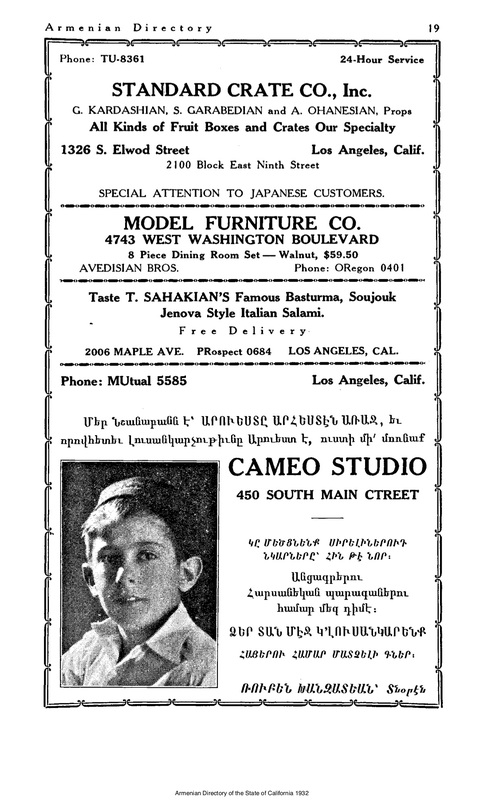 Elegant tailoring was the province of Gregory H. Chashoudian at 4562 Beverly Blvd east of Western Avenue. His skills were endorsed by B.R. Ware, Attorney, who said Mr. Chashoudian’s suits were “entirely satisfactory” and reasonably priced. The world was in the midst of the Great Depression. 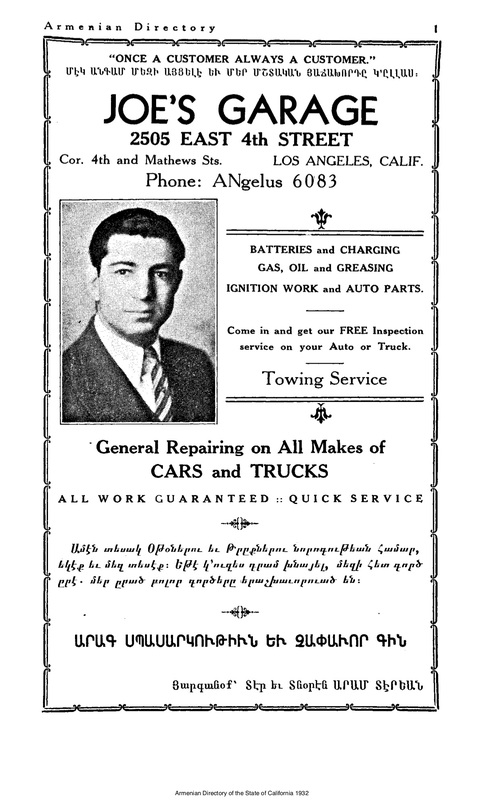 Yet looking through the pages of the Armenian Directory in 1932 one feels a sense of pride and admiration for these industrious people who overcame such grueling tragedies and unjust cruelties. They somehow made it to Los Angeles, CA and established stable and prosperous lives in a new and unfamiliar land.